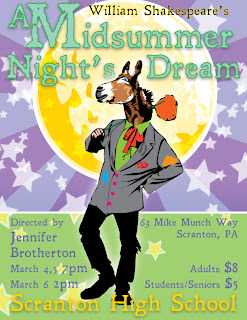 A man in Scranton who works or the high school there wanted to have a poster for the 30's hobo-themed A MIDSUMMER NIGHT'S DREAM they're doing there. Sounds awesome, and I wish I could go. He found me on this blog because I did a hobo drawing a long time ago and stuck it on this blog for kicks. He quickly found out that I do a lot charity work and love Shakespeare. The finished product looks like this. I'm happy with the way it turned out. It's supposedly going on a billboard and some other spots. I enjoyed doing it. It doesn't look great on my screen right now, and I suppose it's because I worked in CMYK and didn't do a proper turn to RGB. YMMV. I hope you like this poster, too. I love the poster! It gives the impression of fun. Thanks. I appreciate it. I've done a lot of Shakespeare stuff over the years. I think I'll post more of it soon.